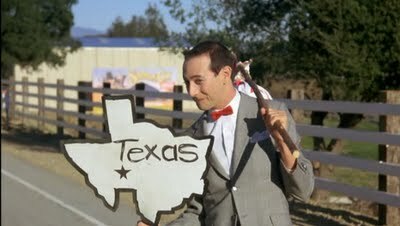 John in ATX: "The stars at night, are big and bright..."
"The stars at night, are big and bright..."
"...Deep in the heart of Texas!" 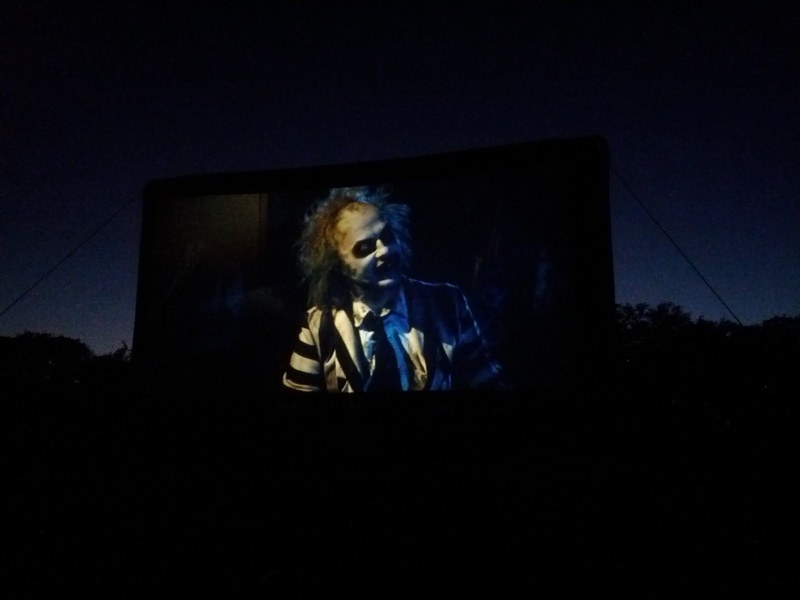 I went to a unique event put on by the Alamo Theaters on Saturday. 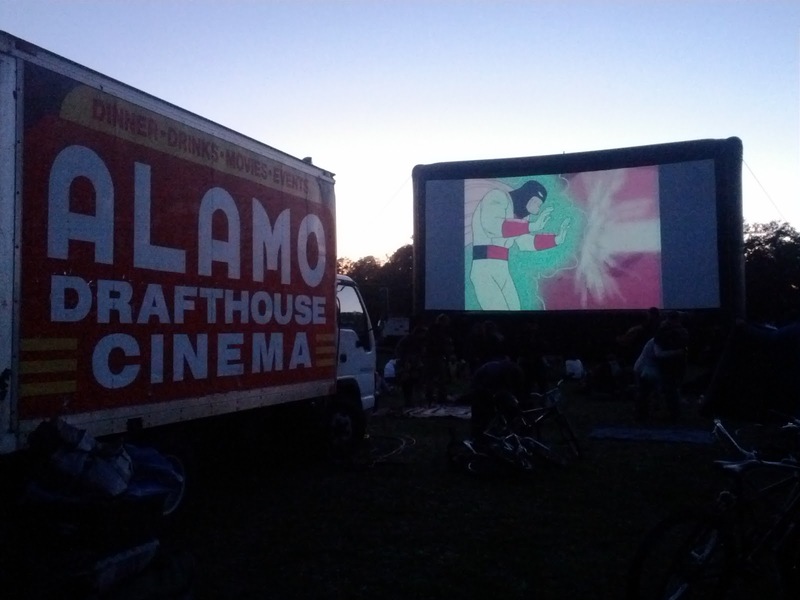 Tim League, the founder of Alamo theaters, is a big cycling and Pee Wee Herman fan so he organized a "Rolling Roadshow" event that features a mobile theater that can be set up at various locations around Austin. 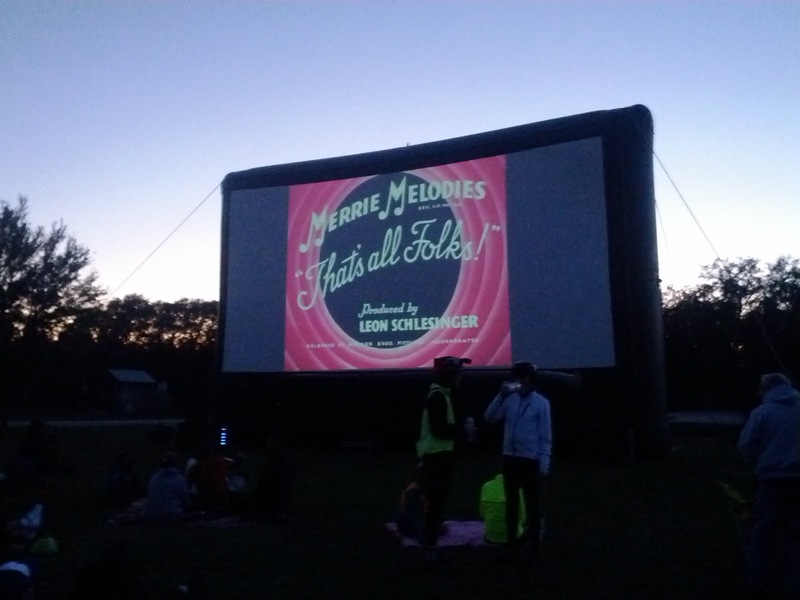 This time, in honor and celebration of "Pee Wee's Big Adventure," a bunch of bicyclists gathered at the brand-new Slaughter Lane location and League then lead us on a ride to the Veloway, where the screen would be set up. Here's the fancy new Slaughter Road Alamo theater. It's a few miles south of Austin and is very cool; you can see a patio on the right side which is restaurant seating for the 400 Rabbits tequila bar that is part of the theater. So the trip got off to a pretty slow start. I drove to theater by myself and got there pretty early, and my friend Dave (the one from Cleveland) met me there with a few of his friends. Bret, another native Clevelander, made the trip from Killeen, Texas with a couple other folks and they all brought their own bikes. 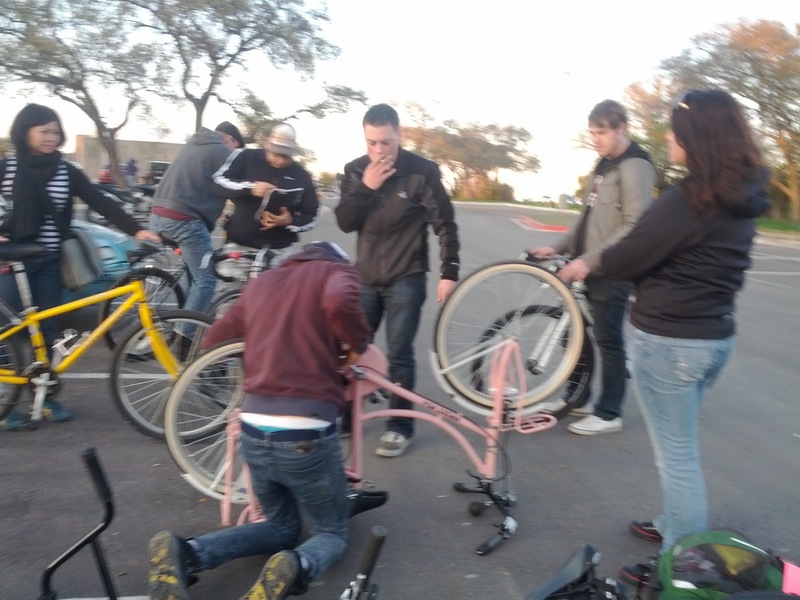 Bret found a lovely pink bike (nicknamed Sweet Pea) the day before the show. Sweet Pea had a few mechanical issues, and thankfully, between the 50-60 riders that were there, the bike got fixed up enough to make (almost the entire) trip. To keep Sweet Pea's chain from breaking, Bret had to use minimal pedal pressure for most of the 2-mile ride. Funny scene with a grown man riding a pink bike, even funnier when he has to use footpower to propel him along a Texas highway. 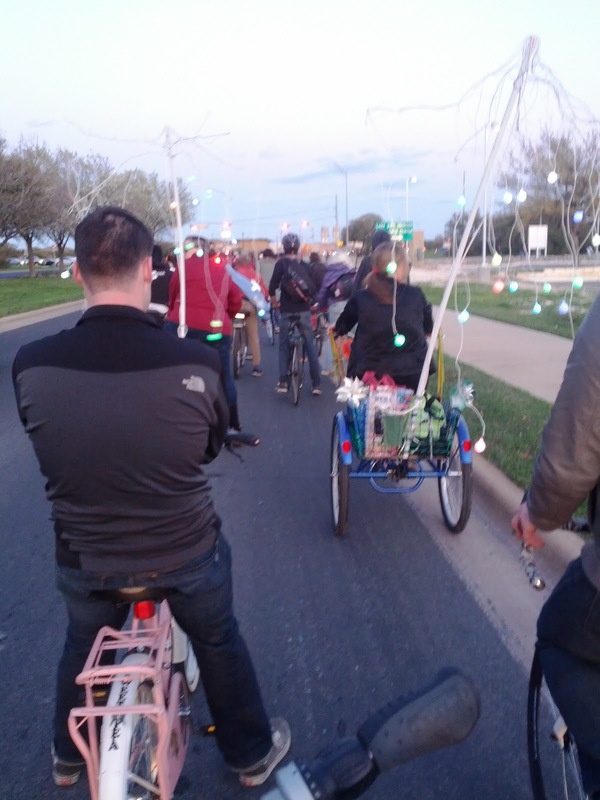 Due to Sweet Pea's problems, our group of five lagged behind most of the journey to the Veloway. Unsafe, I know, but I snapped this shot while riding along Texas State Highway Loop 1. Just as the sun was setting, all us cyclists made it safe and sound to the field where the screen was set up. It was a fun setting for adults and kids alike. Some smart planners brought blankets and snacks for the movie, and we should have done the same. It got colder and colder after the sun went down. The projector runs out of the truck on the right and, as always, the Alamo had some cool old school cartoons and previews to show before "Pee Wee" began. This was a really fun night, especially for a movie-lover and bike rider like myself. 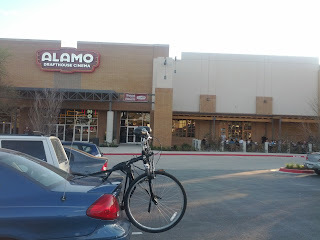 Afterward, Dave and I rode back to the theater while Bret and the others waited at the entrance of the park because Sweet Pea just couldn't make it back. 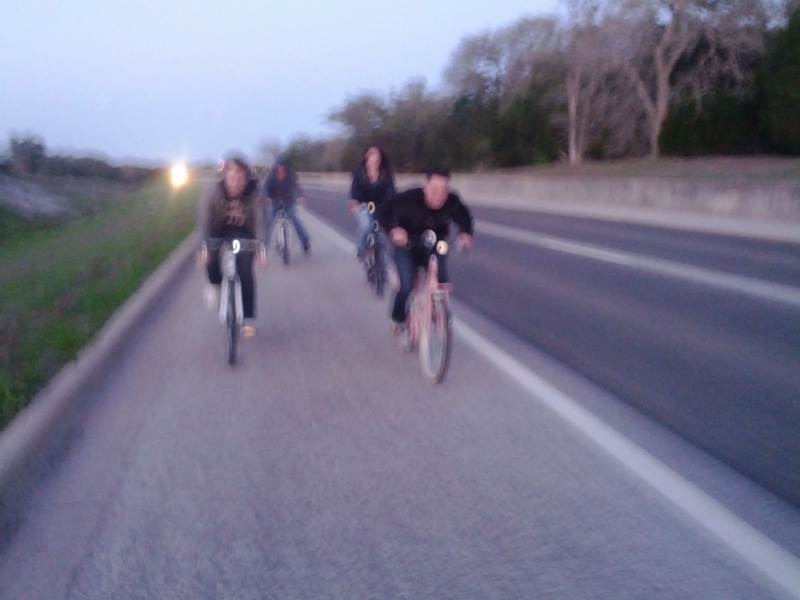 We picked them up, threw their bikes in the back of their truck, then went and ate Tex-Mex and drank margs at Chuy's. The best movie theaters in the country.